A warm, festive 3/4 song with quite a long form; it originally comes from a 1986 recording with bassist Jaco Pastorius. Our "Jon Davis Trio" recording is available in Rhythm Section Workshop format, with Minus You parts for piano, bass, and drums. Jon's Solo Piano recording, and his piano arrangement, and also available. This first recording of Wedding Waltz is rather slower than our trio version ("Jon Davis Trio"), above right. It has the same form, two choruses with a piano solo on the second chorus and the out melody from C. The coda is slightly different: instead of going to the tonic, 4 measures of a IIIm7-VI7 lead straight to the vamp. Bassist Jaco Pastorius solos over the vamp seven times, and then Jon solos for another three times through the vamp, leading to a sort of cadenza. The bass and drums come back in in time for the "tag." This album is Jon's first recording; Wedding Waltz is his earliest recorded composition. Jon recorded two more albums with Jaco Pastorius and drummer Brian Melvin in the fall of 1986. See more detailed notes regarding this song under the "Jon Davis Trio" album cover. This song showcases Jon Davis' knack for lyrical melody, with a warm and festive quality well suited to the title. The form is very long, a stretched-out AABC with a 24-measure first A section, 26-measure second A, 16-measure B and again 24-measure C. The A section is quite diatonic in A♭, with some colorful chords such as E♭7sus(♭9) to A♭maj7(♯5) in the 10th and 11th measures. Another unexpected harmonic transition is B♭m7♭5 to Dm7♭5 on the 19th and 20th measures; these chords go down to D♭m7 in the first A section but up to E♭7sus in the second. The long notes of the melody connect many of these more unexpected chord combinations. The bridge is in the key of E (actually notated in this key instead of using accidentals); the same melody in the first four measures of the bridge, where it is accompanied by descending chords, reappears in the 9th through 12th measures of the bridge with ascending chords from C♯m7. A B pedal at the end of the bridge connects with the E♭ pedal that begins the C (and A) sections. The C section is the same as the first A section. There is no intro on this recording; the coda changes the end of the C section to the same as the end of the second A section, followed by an eight-measure "tag" that is a variation of the preceding eight measures. This leads to an eight-measure vamp, a sort of V-of-V-of-V-of-V turnaround embellished with added tritone substitutions. After the vamp, the same "tag" that appeared before it is repeated one more time to end. On the recording, the bass plays with a steady 1-feel for the first A section of the in head, embellishing slightly on the second A section. Our Minus You piano and drum parts show the bass rhythms below the staff, starting on the second A section and continuing through the in head, the out C section and most of the coda including the last time through the vamp. The bass part has all important drum rhythms notated under the staff. Both the bass and drum parts include the piano melody as recorded for most of the coda, again including the last repeat of the vamp. Unlike most of these Jon Davis Trio recordings, there is no piano melody transcription. An arrangement for solo piano is available; click on the Piano Corner tab for more details. Wedding Waltz was written for the wedding of one of Jon's oldest friends: bass player Joe Fitzgerald of New Rochelle. Davis and Fitzgerald met in Boston and have been playing together since the late 1970s, for instance on a 2009 record date with trumpeter and vocalist Dave Nelson entitled "32nd Street." Perhaps most notably, Davis' Wedding Waltz has been recorded twice by legendary bassist Jaco Pastorius, once on drummer Brian Melvin's trio record "Standards Zone" (see cover above left) and again the same year on Jaco's "Jazz Street." Second Floor Music's first copyright, Rodgers Grant's Morning Star, was also recorded and released on "Standards Zone." Jon recorded a solo piano version two years later, at a session where he also recorded solo versions of five other songs from this 2010 trio session. Click on the "Solo Piano" album cover, above right. Jon's six-page Solo Piano Arrangement shows a few different options for voicing the melody. The first A section begins with block chords, while the second A section fills in the rhythms a little by building up the voicings with the melody and root on the downbeat, the second-lowest note on the "and" of beat 1, and the rest of the chord on beat 2. The C section version is the same but with the second-lowest note joining the rest of the chord on the second beat. Sequences of octave leaps, which Jon employs in a few places on the recording, appear near the end of the second A section and also in the coda. This arrangement's coda lacks the "tag" before the vamp, instead having the vamp only once followed by the final "tag." It might be interesting to watch Jon's solo piano performance from his solo piano session at Van Gelder's, comparing it with the arrangement. Click on the "Solo Piano" album cover above right, then scroll down for the video of that performance. On the Wedding Waltz Minus Bass track, bassists can challenge themselves to play over Davis's unconventional changes and a cleverly deceptive form. As bassist Daryl Johns demonstrates on the trio recording, this tune works well with a light feel that still carries a bounce. The vamp provides a fun opportunity to stretch over a turnaround, as well as to work out different ways of playing time on a waltz, including 4 over 3. 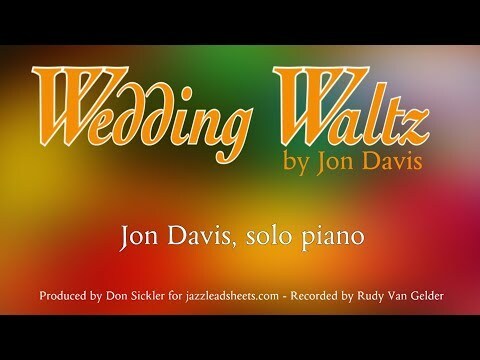 Wedding Waltz is a light and romantic piece by Jon Davis. The piece is in the time signature of 3/4 which you could probably guess by its title. The drummer on this piece alternates between a 1-feel, 4/3 swing feel, standard jazz waltz and many other variations and beat groupings, as the bass player's relaxed playing allows for tons of freedom from the perspective of the drummer. This melody is extremely beautiful and will have you singing along behind the drums. The freedom this track gives you, as you experiment with going between different variations of 3/4 time, is great. Because of the long form, this recording is only two choruses long. After a piano solo on the two A sections and B section of the second chorus, the out melody is played from C.
Jon Davis performs his WEDDING WALTZ on Rudy Van Gelder's magnificent Steinway D.
Like the trio version, Jon's solo piano recording is two choruses long. He improvises on the two A sections of the second chorus and takes the melody out from the bridge. The tempo is similar to that of the Jon Davis Trio recording (above left). It's interesting to compare this recording to the Solo Piano Arrangement. Though his recorded solo interpretation is quite free, as expected, there are several places where he plays the same voicings as his written arrangement. This is particularly notable in the first half of the bridge. As with our trio version, but not the written Solo Piano Arrangement, this recording vamps at the end. The eight-measure vamp phrase is slightly different here from the trio version, without the tritone substitutions on the 6th and 8th measures. Check out Jon's other solo piano compositions recorded by Rudy Van Gelder. On this day in May, 2012, Jon appears and sounds completely relaxed as he explores his early composition, Wedding Waltz. Great that we had video cameras in the booth with him.